Kurtis is a 25-year-old saxophonist with a Bachelor of Arts degree in Music Performance from Graceland University. 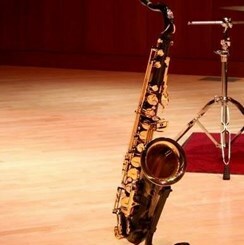 While saxophone is his primary instrument (and the one he enjoys the most), he also plays guitar and bass. He has worked on and behind stages and works with recording sound. His musical interests range from classical and romantic to jazz and metal. Kurtis can be found behind the band instruments counter and accessories ready to help.